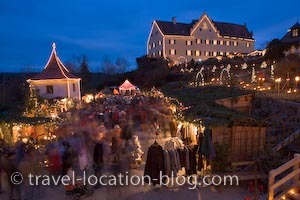 Dressed warmly, we spend an afternoon wandering through the many stalls of the christmas markets on the grounds of the Hexenagger Castle in Bavaria, Germany. the castle in the town of Hexenagger, Bavaria, Germany. As a recommendation by some friends, we took a trip to the town of Hexenagger to see the christmas markets at the castle. From Freising it was a trip of around 45 minutes and when we arrived we were stunned to see several fields (turned car parking lots) full of cars and buses and even as late in the afternoon as it was, more people were arriving. Oh my, it was looking like it would be mighty crowded in there. We found a parking space fairly quickly and donned our gear before heading up - it was a very cool and icy afternoon so we also had to dress warm for the visit. After collecting our entrance tickets from a roadside stall, we started walking the steep but well paved path to the castle along with the multitudes of other people who'd had the same idea. Before long we were unzipping our jackets and reaching for the water - the walk was steeper than we first thought it was and we discovered that we're a little out of shape - at least it was a short trek! Once at the entrance it got really interesting - there was no moving forward and there was no moving backwards as it was such a tight "log jam" of people. We eventually made it through the crowd and into a marginally more open space to reorganise before heading off to explore the delights of the christmas markets. As we wandered through the stalls, we discovered many things to feast our eyes on .. wonderful works of art and beautifully handcrafted ornaments, and gifts. Yet another place we could've gone crazy in and spent a small fortune! Entertainers were also a highlight - a man on stilts dressed in golden colors interacted with the crowds on his search for his missing christmas gifts, while a choir sung christmas carols, and craftspeople demonstrated the creation of unique works of art. The massive castle dominated the scene with its massive walls cloaked in cloth advent calenders. As the afternoon wore on and eventually gave way to the evening, the delicate lights which were scattered around the grounds, over market stalls, and in trees came to life and added to the mystical atmosphere of the markets. It was a beautiful event in a magical location - albeit extremely crowded! After twilight, we decided to pack up the gear and head off, we had a dinner appointment that night - a meal at a traditional Bavarian restaurant consisting of locally caught game.